In January, Halloween and Christmas seem like they’re a million years away. After all, many of us are still recovering from the holiday season and trying to balance daily life with the lofty New Year’s Resolutions we’ve committed to (until at least February 1). Over here, however, we’re already looking forward to our next season after spending last week at the Las Vegas Winter Market. One of our favorite things about putting together our boutiques each year is deciding on an overall aesthetic for the season. At trade conventions and design shows, we get an opportunity to see all of the available holiday merchandise months before it hits the stores and catalogues, and it’s our job to sort through it to figure out what will hit most with our customers months down the line. What trends do you see hitting big this year? Let us know in the comments! 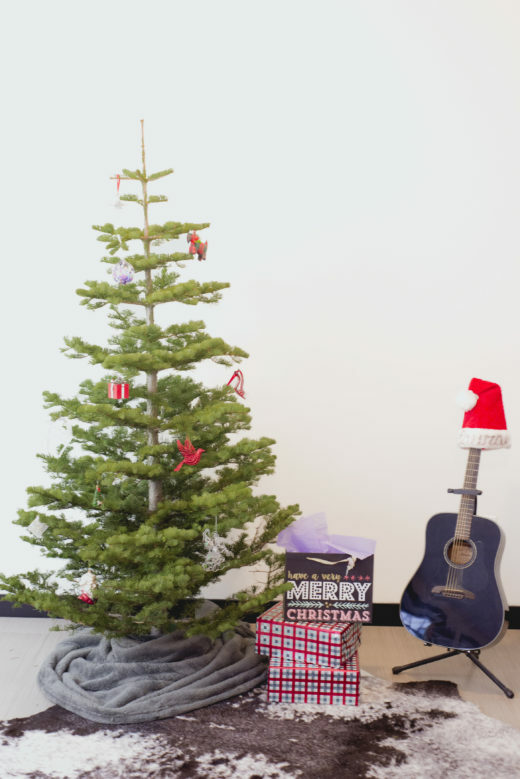 Sometimes when you live in a big city like Los Angeles or New York, it can be tough to imagine getting a real tree into your apartment or loft, but we are here to tell you that you can! 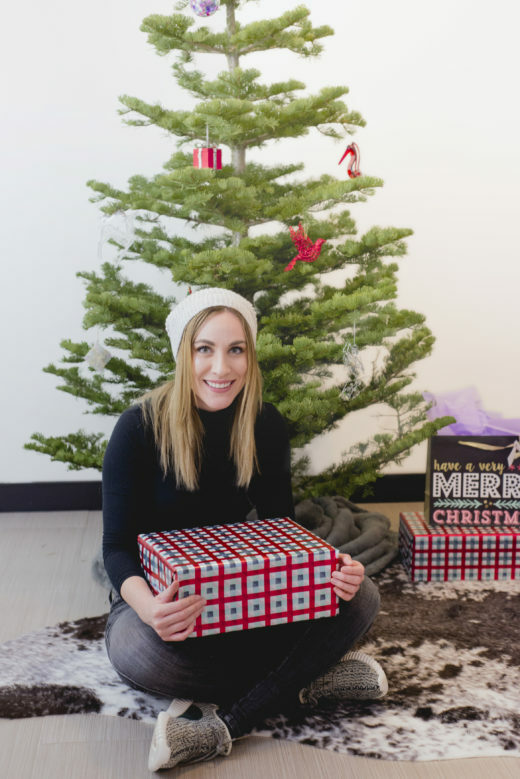 Why opt for a fake tree when you can have a real one delivered from Mr. Greentrees, nothing puts you into the Holiday spirit quite like a real tree does (plus they smell delightful). Before you head down to the tree lot just be sure to measure your ceilings and your doorway so you can be sure that the tree you get will fit your space. Try keeping it simple, odds are if you live in an apartment you don’t have a ton of storage space, which likely means you don’t have a ton of decorations in boxes. 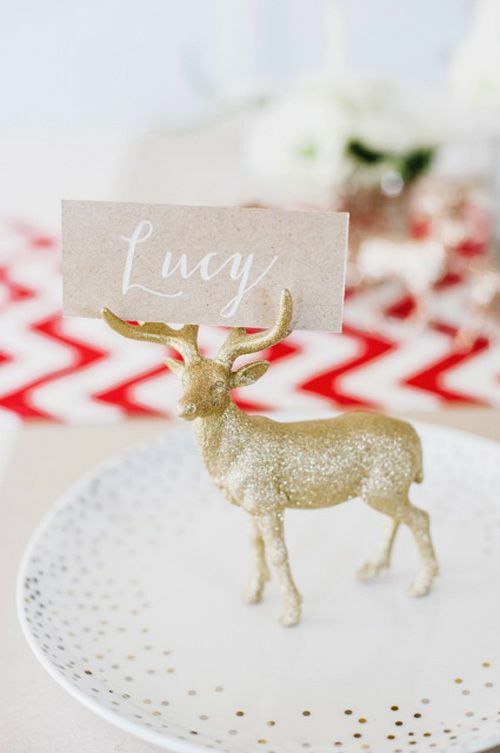 So why not go for the minimalist approach that’s been all over the blog-o-sphere this year? We are loving how Mr. Greentrees employee, Laura-Elise Barrett decorated her downtown loft with one of our silver tip trees! 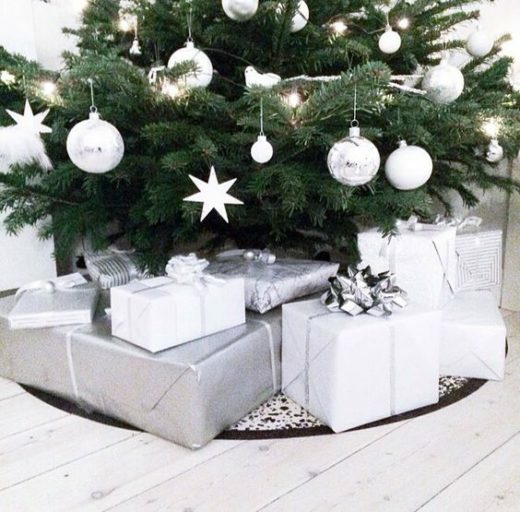 What made you want to get a real tree this year? L : I’ve been doing social media for Mr. Greentrees and seeing all the cute ways people have been decorating and I really wanted one! I have never had my own tree since I’ve been an adult because decorating seemed kind of pointless when you live alone but this year I wanted to really get in the spirit. 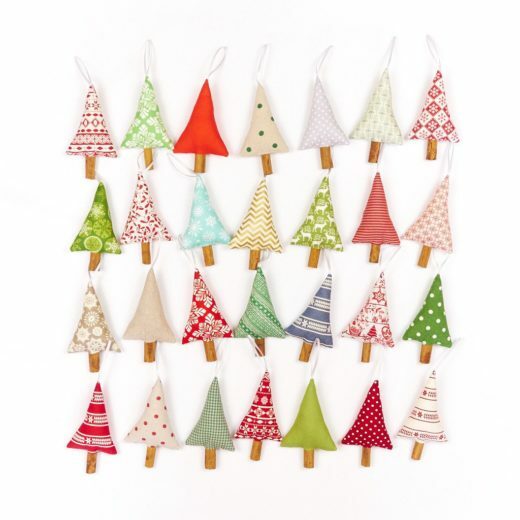 Did you have ornaments or did you have to go buy them? Did you plan to keep it minimal? You know, I didn’t really have a choice, I only own the one box of ornaments and a Santa hat, but I live in a very modern looking loft space so it kind of works. I planned on going and buying lights for the tree but then I remembered that my cat is crazy and would probably destroy the tree trying to play with the cords so I opted out. I’m really happy with how it looks without them though. Why did you pick a silver tip tree? I was looking for inspiration on pinterest and everything I liked involved a silver tip. I really like the uneven spacing, I just think they look really cool and different. Are you glad you got a real tree? Definitely! My apartment smells amazing. Many people associate the month of December with Christmas, but for others it is all about Chanukah! Some people (like myself) even get to celebrate BOTH. This year Chanukah starts on Christmas Eve so what better way to combine the two than to celebrate with delicious food? Some of my favorite December memories growing up are associated with the food and games at Chanukah. Playing dreidel with my cousins to win gelts while my aunt made her famous matzo ball soup is something I will never forget. As an adult, when started celebrating Chanukah on my own, I asked some of my family members for their Chanukah recipes and was shocked to find out that pretty much the whole time they were using Manischewitz boxed mixes for just about everything. Now, there’s nothing wrong with that, in fact to this day the boxed latke mix is very nostalgic to me, that said, I wanted to experiment with some more refined recipes. So I did what anyone would do and took to Google. 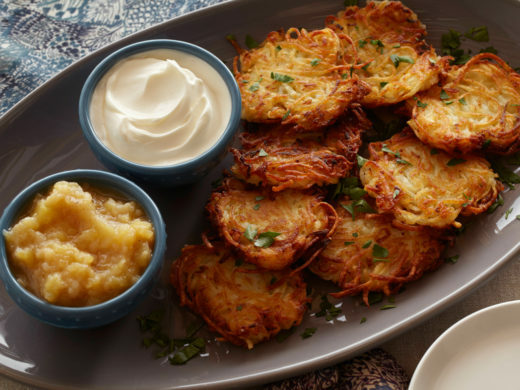 After a couple hundred trials and errors (mostly errors) I think I have finally found my go to Chanukah menu and I’d love to share it with you. Lox Bagel Bites– I love lox and cream cheese on a bagel, so I put my own little twist on it and started making bagel “bites” as an appetizer and I have yet to hear a complaint. The recipe is simple, cut mini bagels in half, toast in either a toaster oven or on the stove & let cool. Then spread cream cheese on top, add lox and some fresh dill or capers and you have a perfectly simple appetizer that everyone will love. Latkes- It’s not Chanukah without the latkes, but I have since put down the box and opted for the homemade version. This recipe from Kosher in the Kitchen found here has become my go to. Keep it classic and serve with sour cream and chives or apple sauce, or try my personal favorite and serve with a paprika hollandaise sauce! Recipe found here. Multi Veggie Kugel- Get your veggies in here with this amazing recipe, also from Kosher in the Kitchen, it is so good even the kids will eat it right up. Find the recipe here. Roasted Lamb with Sausage Crust and Fresh Grape Pan Sauce- Instead of brisket, I have started to go for lamb around the holidays, this recipe has never steered me wrong (although, it does take a few tries to master so I recommend trying it out before serving it at a holiday party) you can find the recipe here. Don’t forget the chocolate gelts for the kids (or yourself, you know, whatever) and the candles for the menorah and you’ll be sure to have an incredible Chanukah party that everyone will enjoy! Posted in Mr Greentrees | Comments Off on All About Chanukah! Thanksgiving is just a few days away and then it is time for Mr. GreenTrees to open for all your upcoming Christmas needs! But before we dive into Christmas, let’s take the time to give thanks for what an amazing season we had at Mr. Bones! 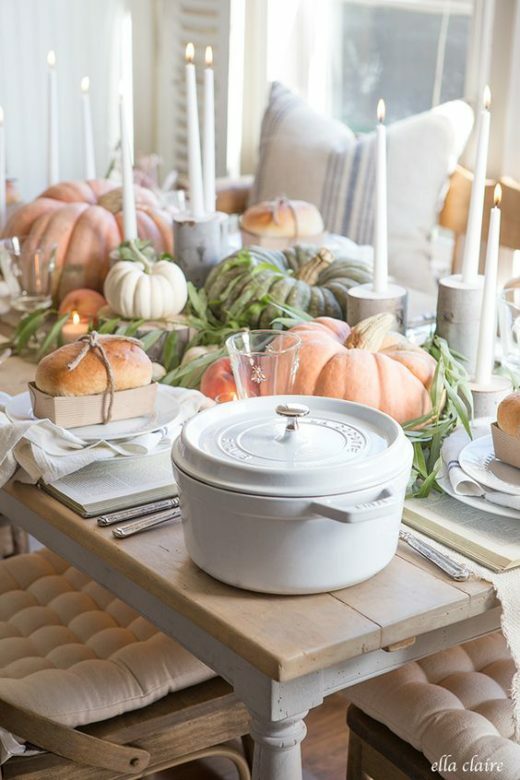 If you’re anything like us, chances are you still have some of those gorgeous pumpkins and gourds leftover from Halloween, but before you toss them, why not use them in a creative way for Thanksgiving? 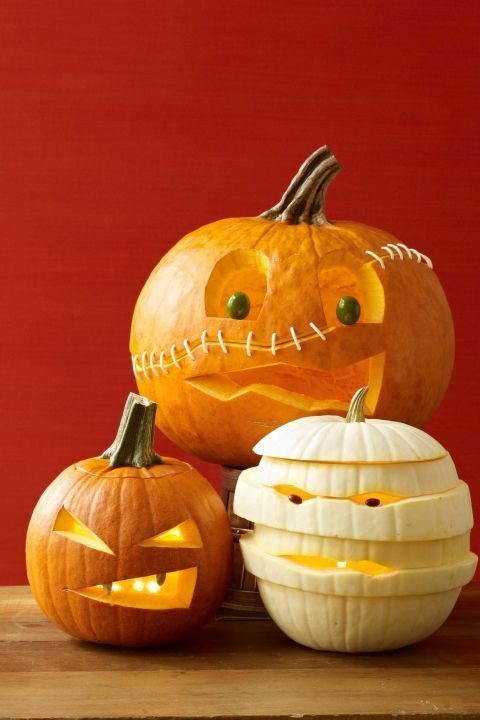 Here are some cool, fun ways to get the most use out of those pumpkins. 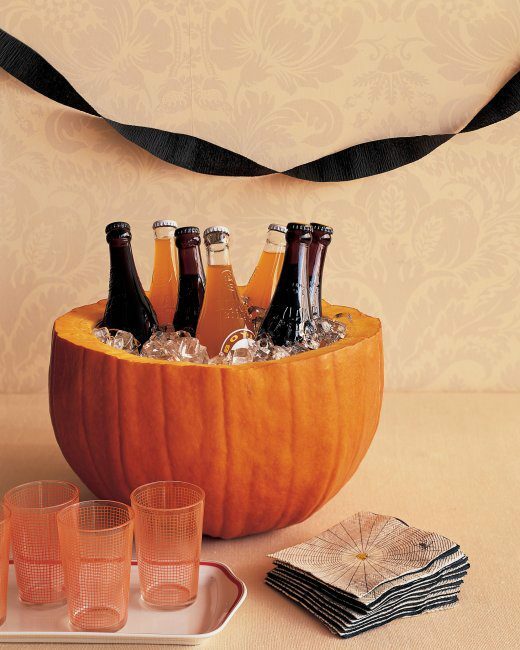 Cut them in half, hollow them out, and use as an ice bucket for white wine, champagne, or even soda! 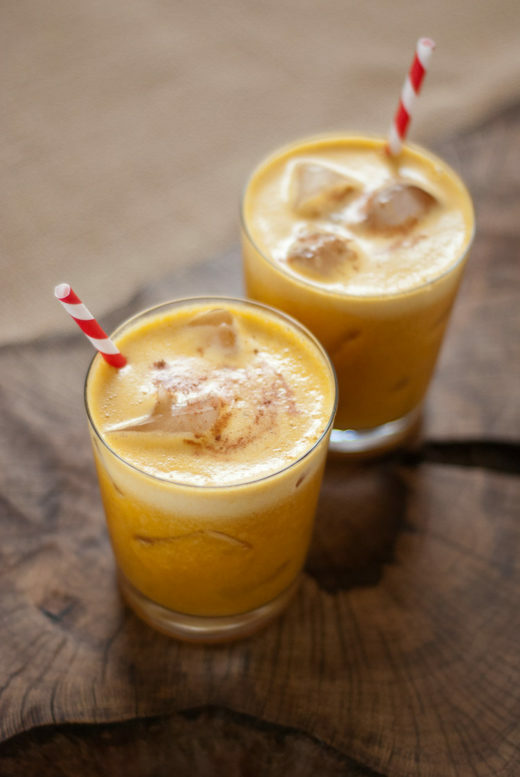 Create a pumpkin puree and use it as a base for pumpkin infused cocktails, pumpkin pancakes for your morning guests, the possibilities are endless! For some recipe inspiration click here or here. Use as soup bowls! 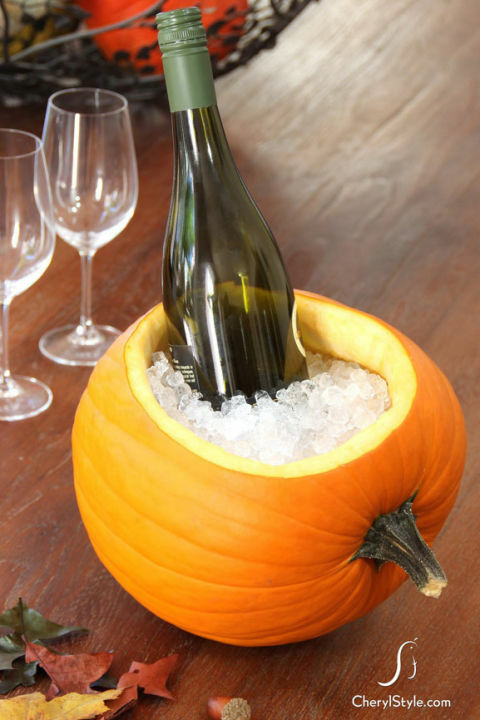 Small to medium size pumpkins would be perfect for this! 5. 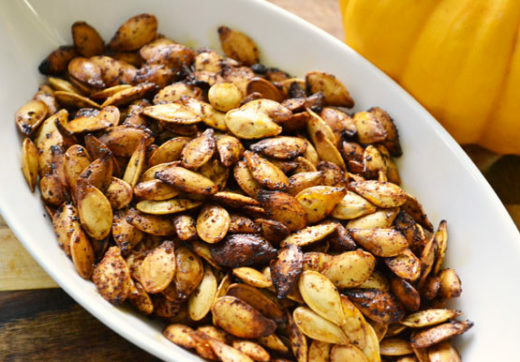 Roast the pumpkin seeds with salt, paprika (or cayenne if you’re feeling spicy) and a little olive oil for a delicious snack to graze on while the turkey is in the oven! One of the greatest things about Mr. Bones is that we allow pets! As long as they are carried or on leash you are more than welcome to bring your furry friends along to the patch. 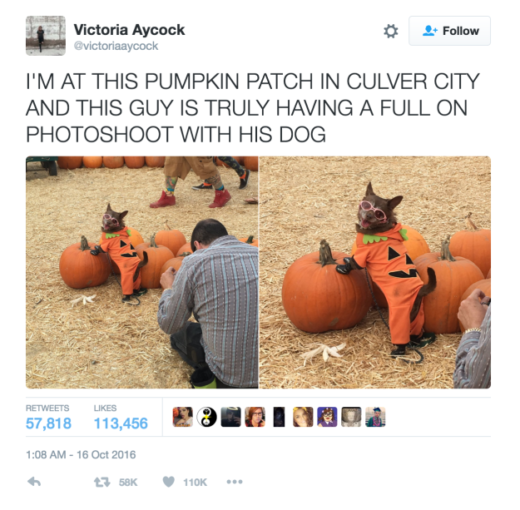 This year we had one of our regular canine guests, Miss Coco Puffz (@misscocopuffz) go absolutely viral for her adorable pumpkin patch photoshoot (see below). So in honor of this viral sensation we decided to team up with LootCrate, LootPets, and Best Friends Animal Society to host an adorable dog costume contest (a couple of cats joined us too) and mobile adoption event! And of course, we had a costume contest for the kids too. The contest was hosted by Stephen Kramer Glickman of Storks and Big Time Rush fame and judged by a team of esteemed celebrity judges. Winners of the contest won AMAZING prizes from LootCrate (Miss Coco Puffz won best dog costume & took home a year subscription to LootPets!!) and a couple of adorable puppies and kitties got closer to finding their forever homes thanks to the mobile pet adoption truck run by Best Friends. 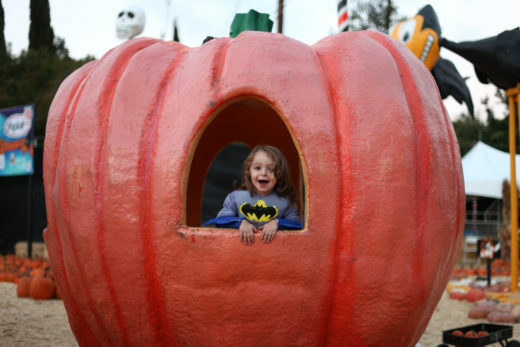 Posted in Culver City, Halloween, Mr Bones Pumpkin Patch | Comments Off on Puppies at the Patch! How to Decorate for the Fall Holidays with Mr. Bones Pumpkins! 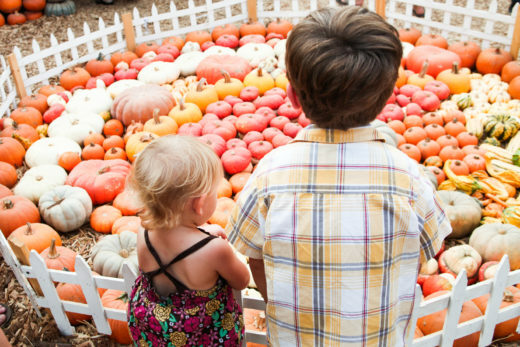 Decorating for the Fall Holidays (Halloween & Thanksgiving) can be super fun and what better way than to head to a pumpkin patch, grab some of your favorite pumpkins, squash, and gourds to make your home look extra festive! We know the internet can be overwhelming with decorating ideas, so to help you avoid the Pinterest fails this season we figured we’d scour the internet for you and share some ideas that actually work when decorating with those pumpkins you picked up at Mr. Bones! Let’s start with some fun Halloween pumpkin ideas! 2. 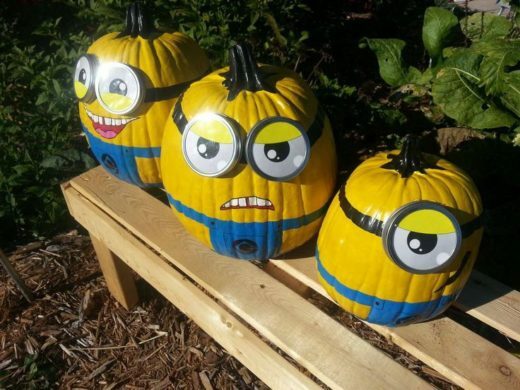 Minions were all the rage with kids this year so why not incorporate some of their favorite characters into their pumpkins? All you’ll need is some yellow, blue, and black paint, a couple of mason jar lids and a little imagination. 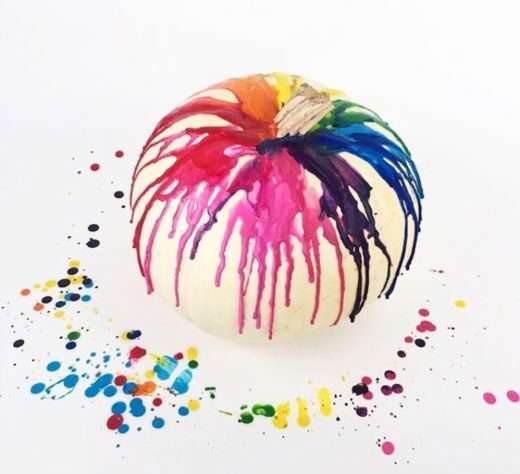 Or if you’re feeling pressed for time swing by on a weekend and have our resident pumpkin painter Pashur paint one for you! 3. Nothing beats the feeling of actually carving the perfect pumpkin that you took the time to pick out. 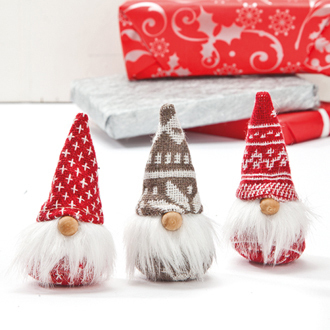 So how about trying this super cute trio? The olive eyes, almond teeth, and red hot mummy eyes really add a nice touch ha! 4. We are big fans of all the mini pumpkins and gourds we have but did you know you can carve those too? 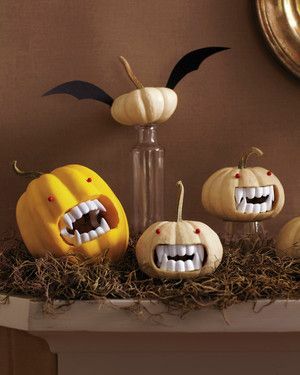 We love this idea from MarthaStewart.com that turns the minis into little vampires with the addition of some plastic fangs and red gems for eyes. However, once Halloween is over it’s not time to put those pumpkins away just yet! 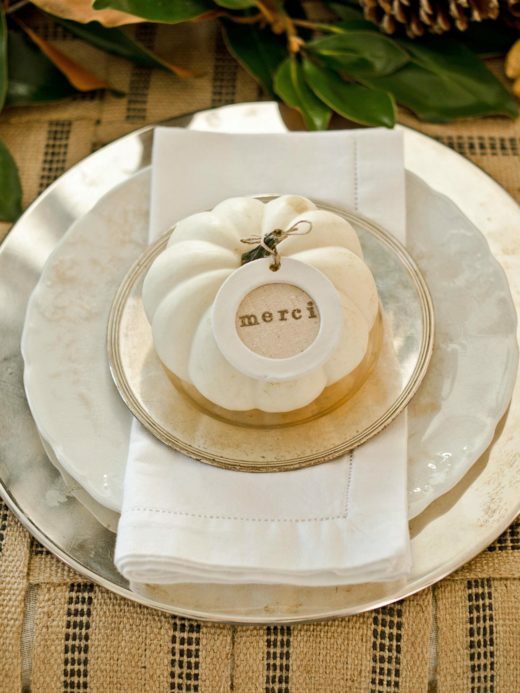 One of the best things about Mr. Bones is that we carry such a variety of pumpkins that they can be used to create beautiful Fall themed tablescapes all the way into November. 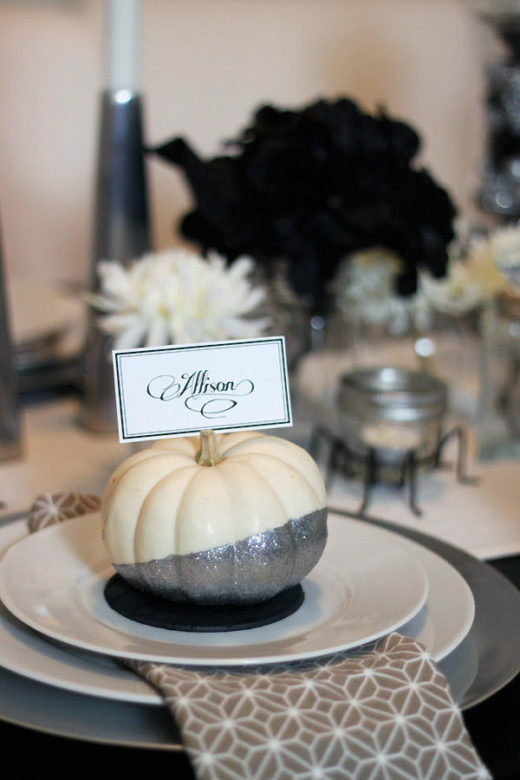 Try some of these ideas for your Fall dinner parties and your guests will sure to be impressed. Some of our favorites at the patch are the light orange and grey pumpkins which make for stunning fall decorations, just look at this setup by designer Ella Claire below! If you’re not in LA and can’t make it to Mr. Bones be sure to ask for “Cinderella” pumpkins and “Jarradale” squash to find these unusual squash. Complete the look with some wooden tree stump plaques like the ones found here , some sage leaves, and white candles. 2. 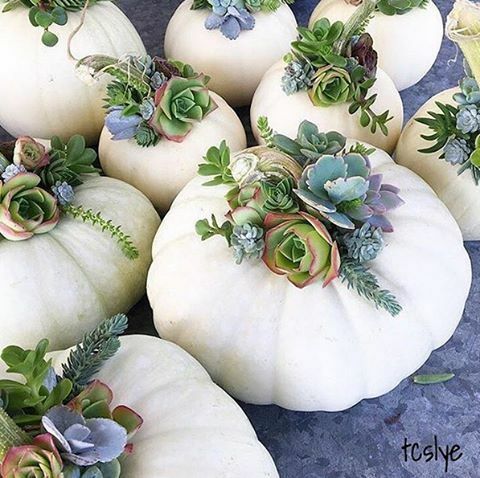 Another great and simple idea we came across were these super cute pumpkins stuffed with succulents! 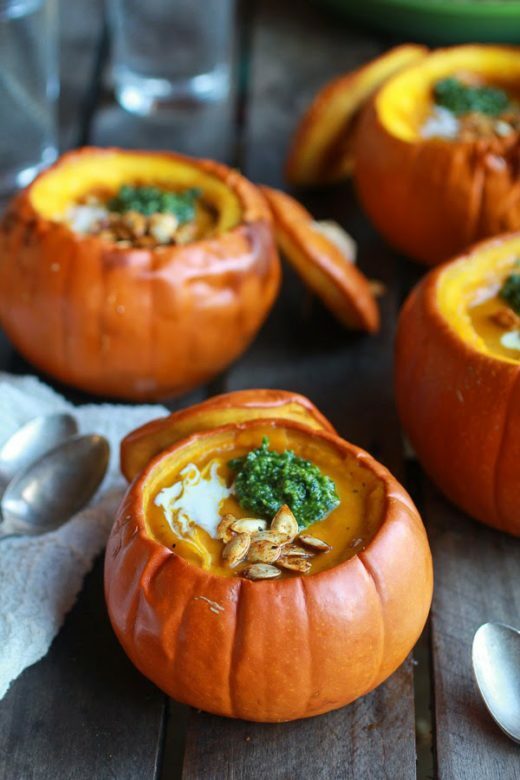 They look so chic and are so simple to make, simply carve out the inside of any small white or orange pumpkin and insert any assortment of succulents that you prefer. 3. Perhaps the easiest of all the table set ups, but still gorgeous is this one with the lantern. All you have to do is purchase an assortment of mini gourds and fill an empty lantern for a centerpiece that is nothing short of perfection. 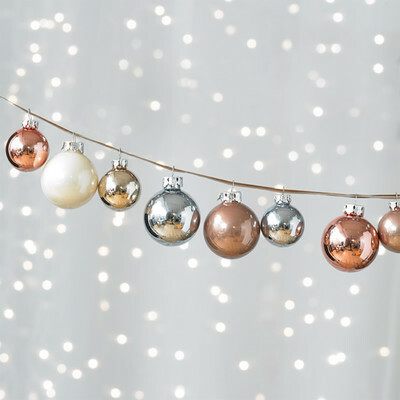 This would also look amazing with a copper lantern if you can find one! Well, we could go on all day about ways to use our pumpkins to make your house perfect for the holidays but we will stop here for now. Have more ideas for us? Let us know in the comments! Posted in Holidays, Mr Bones Pumpkin Patch | Comments Off on How to Decorate for the Fall Holidays with Mr. Bones Pumpkins! Halloween Costume Inspiration, Mr. Bones Style! 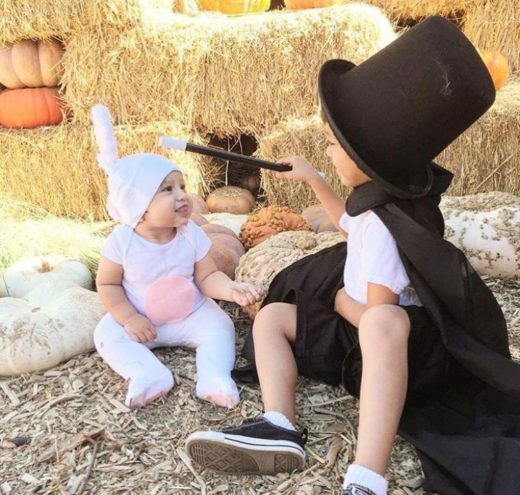 As it gets closer to Halloween we are seeing TONS of cute costumes coming through our doors, so we thought we would share some of this awesome inspiration with you all in case you were stumped on what to be this October 31st! We are loving these Mommy and Me matching costumes!! How AMAZING does model and blogger @SarahStage and her son James look here?! Animal costumes will never not be cute on babies. 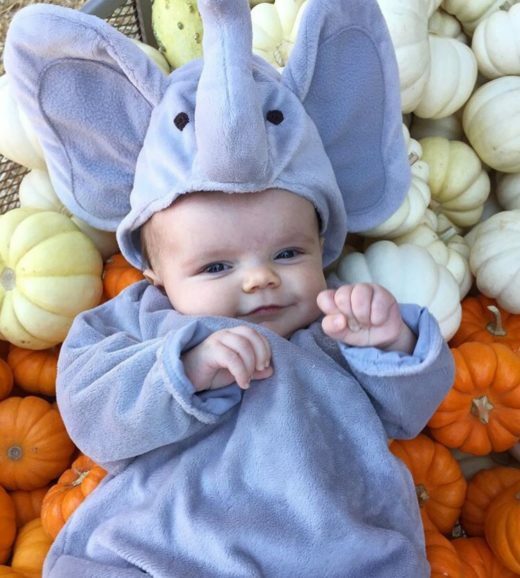 We are loving this elephant outfit on @AliFedotowsky ‘s baby Molly! 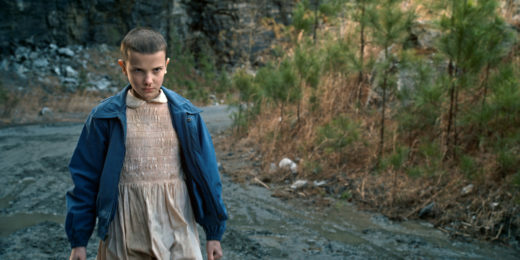 Stranger things is all the rage this year and what better character to be than Eleven?! If you have a couple of kiddos take a cue from @happymessmoments with this magician/bunny combo! Adorable! These are just some of our faves from the last couple of weeks at Mr. Bones, comment below if you have any other great ideas for this Halloween!! 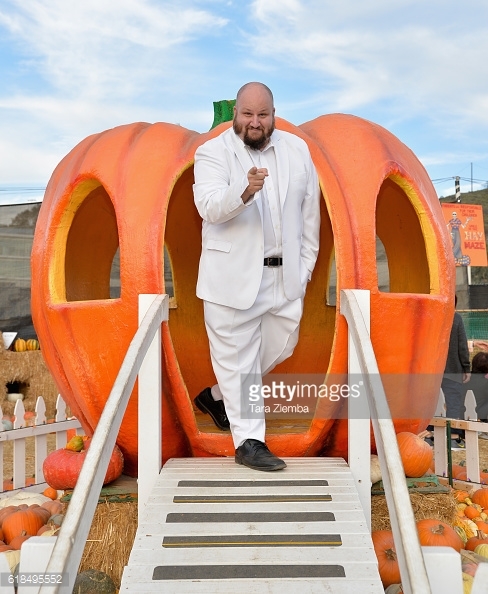 Posted in Culver City, Halloween, Mr Bones Pumpkin Patch, Uncategorized | Comments Off on Halloween Costume Inspiration, Mr. Bones Style! We made it! It is officially October and Mr. Bones has been open for almost a week! We started this year off with a bang and on day one hosted a VIP playdate for the Fashion Mamas– which is a members-only network for influential mothers who work in fashion and creative industries. 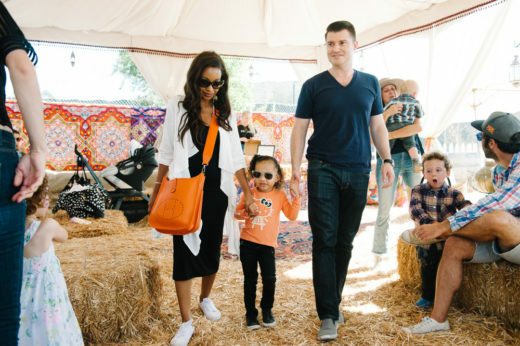 We were so excited that the Fashion Mamas chose Mr. Bones for their Halloween inspired meetup/playdate and we had a blast watching their kids play in the hay maze, ride the pony rides, play in the petting zoo, and get their faces painted (and we especially loved seeing all the amazing kid-fashion for Fall)! Below are some of our favorite family moments with the Fashion Mamas, for more photos or info about the Fashion Mamas (like how to join this super cool crew) be sure to check out their blog here ! 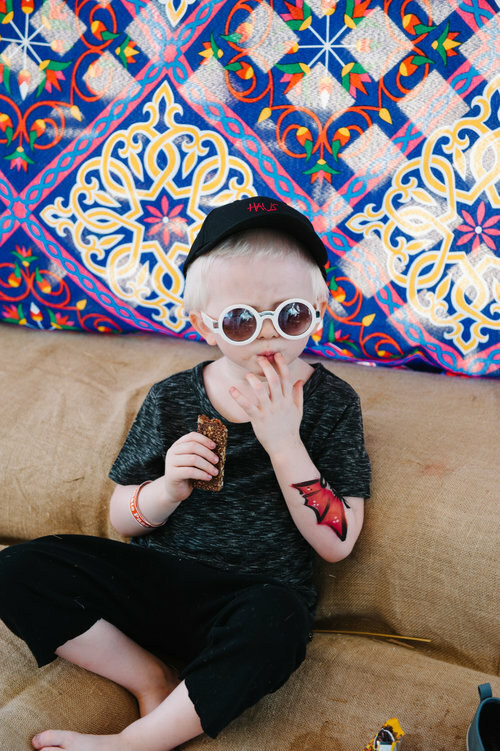 And if you’d like the VIP experience like the Fashion Mamas complete with access to our beautiful VIP tent be sure to ask about the VIP wristbands at the door or purchase them online! 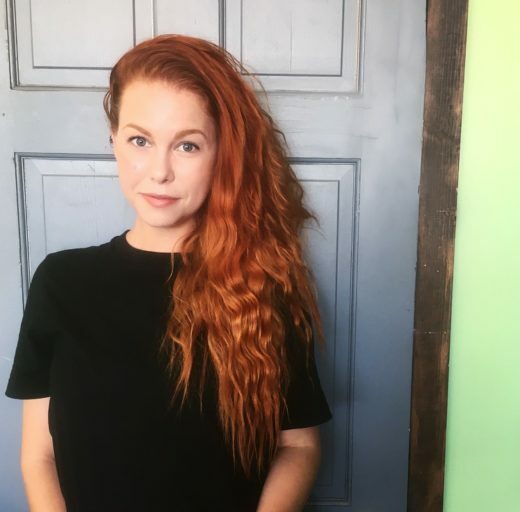 Employee Spotlight : Jennifer Lynne. Here at Mr. Bones we are so much more than just a pumpkin patch. Over the years we have truly become a family, which is quite a feat considering that we are a seasonal business. We have been so lucky to create bonds with our employees and customers so that both come back year after year! So every couple of weeks we are going to put the spotlight on one of our awesome employees to say THANKS and showcase each of their unique style’s! First up is our administrative manager, Jennifer Lynne. Jennifer is hardworking, stylish, and LOVES Halloween (and seeing that her birthday was coming up this month we had to take this moment to celebrate Jenny!). When you come down to Mr. Bones this October you’ll be sure to see her running around so make sure you say hello! If not in L.A., where would you live? Maine, somewhere in the woods in an amazing little cabin. My dream vacation would be to… Right now, I’d love to be in a spa in France… getting a massage and wearing lots of fall layers when I go outside. My current obsessions are… Dorky Halloween t-shirts and vegan desserts. If I could go back in time to one decade… I just finished season 2 of Aquarius, so I’d like to go back to the late ’60s and get involved in the scene, man. As a teenager I was totally into… Weird, dark, creepy things. Not much has changed, but I dress better now. The best thing about my job is… Meeting celebrities who are just as into Halloween as I am. 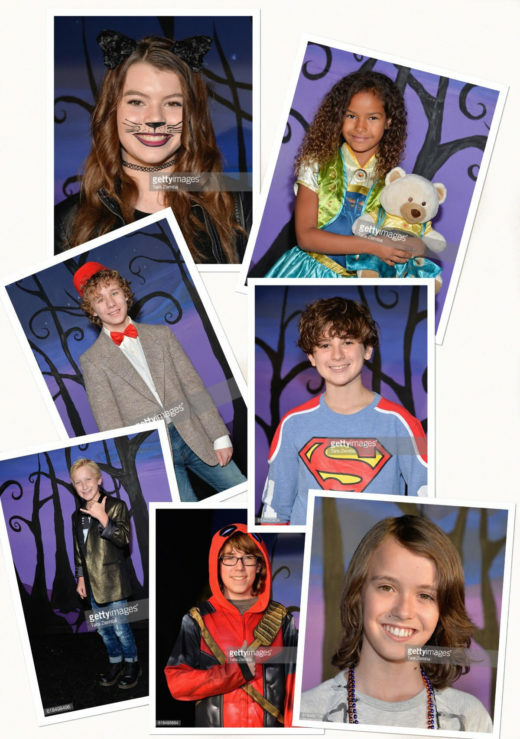 My favorite holiday is… Halloween! I’m an October baby, so my birthdays have always centered on Halloween. Getting presents AND candy AND costumes all at once is the best thing in the world. My best Halloween memory is… I don’t know if I have just one! I loved trick or treating with my friends every year, especially once we were old enough to go without our parents. I grew up in the suburbs, so trick or treating was a very big deal. Roving gangs of costumed children everywhere. I definitely trick or treated well past the point when I should have stopped. I think I was 19 the last time I went, but I got away with it because I still looked 15. I’m scared of… Ants. Seriously, they freak me out because they swarm. Also, zombies, for some reason. Not the fast zombies, but the original “Night of the Living Dead” Romero-style zombies. I love them, but they freak me out. Fast zombies aren’t nearly as creepy. If I could be anything for Halloween, it would be… This year, I wish I could get Christina Ricci’s black-and-white striped dress from “Sleepy Hollow” and go as Katrina. Or just wear it to work. And everywhere in general. I want that dress. My favorite Halloween costume ever is… I’ve always been happiest as a witch. It just feels right! I’m also super proud of the year I went as Jason Voorhees, because people kept telling me a girl couldn’t go as a slasher monster. I was supposed to be something pretty or cute, but I wanted to be an unkillable homicidal maniac. Fight the system! To follow Jennifer on Instagram click here! Posted in Culver City, Halloween, Mr Bones Pumpkin Patch | Comments Off on Employee Spotlight : Jennifer Lynne. October is quickly approaching and we are so excited to open on October 1st! 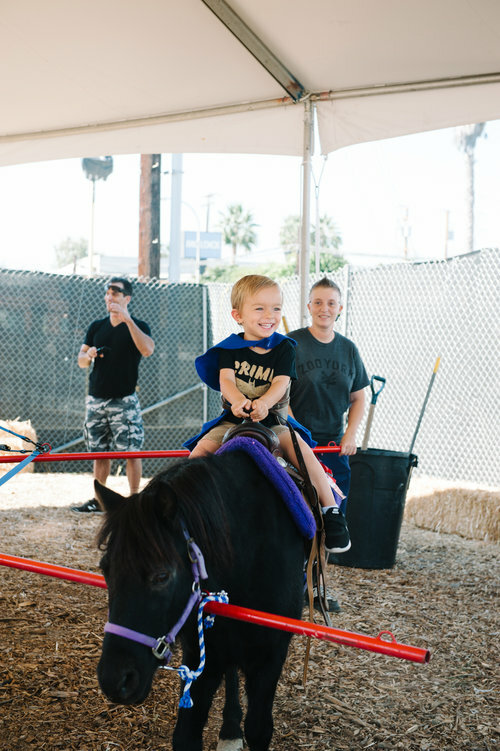 Halloween is hands down one of our favorite holidays and we can’t wait to see all of your smiling faces at our pumpkin patch in Culver City this year! We will be sure to have the best pumpkins in town that were grown in both Oregon and Northern California including unique varieties you don’t see everyday. 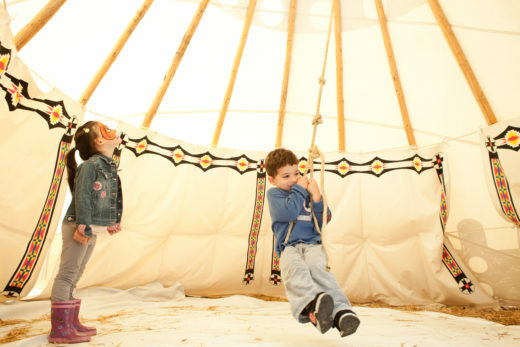 But we not only have the best pumpkins, we also have an abundance of activities that are fun for kids and adults alike! 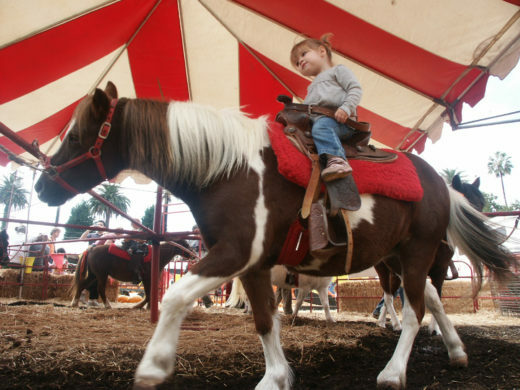 The petting zoo will be back and better than ever, there will be slides, bouncy houses, a straw maze, a pumpkin decorating station, pony rides, face painting, and of course our signature teepees for some very Instagram worthy moments. Be sure to follow our blog this season for pumpkin carving ideas, decorating tips, costume inspiration and all the fun happenings at Mr. Bones! Also make sure you’re following us on Instagram @Mr_Bones_Pumpkins for new inspiration every day. To get you as excited as we are, here are some of our favorite moments from 2015. We can’t wait to create more of these memories with all of you! Posted in Culver City, Halloween, Mr Bones Pumpkin Patch | Comments Off on October is Almost Here! ©2019 Pumpkins + Trees All Rights Reserved. Kindly ask permission before using any personal images.